The Malta Union of Bank Employees - MUBE represents the overall majority of managerial, supervisory and clerical staff at HSBC Bank Malta. MUBE has successfully negotiated agreements for these categories of staff since 1999. 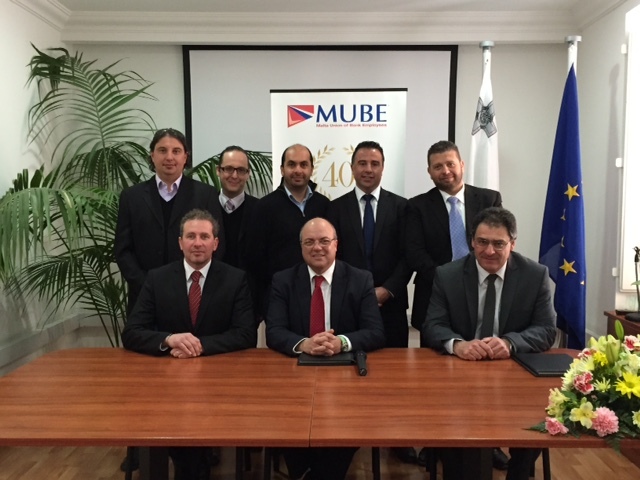 The current agreement expired at the end of 2013 and MUBE and HSBC have been negotiating its renewal since October 2013. Agreement was reached in August 2014 but although signing of this agreement was planned to take place in September 2014 this was not honoured by HSBC and the package withdrawn unilaterally. Since then all attempts to come to a compromise agreement have failed. In view of this MUBE has held eight days of escalating industrial action against HSBC Bank Malta, which included a total communications ban, a sit in strike and a full blown strike - directives which were followed by around 90% of staff. The GWU acted in solidarity. Apart from not taking the local workforce and collective bargaining seriously, HSBC's decision to threaten Lock Out against those employees obeying the directives is also an insult to customers. MUBE is seriously concerned with HSBC's behavior and attitude towards the local workforce which is undermining career prospects to local hard working employees. The Union cannot accept such an intransigent approach to negotiations whereby the Bank has decided to unilaterally withdraw an originally agreed Collective Agreement at the end of last August's negotiations. No reasonable efforts to seriously negotiate have been forthcoming from Bank management. This has been also aggravated by unacceptably low increases in salary and mediocre bonus awards which emanated from a unilateral decision taken by the bank outside the Collective Agreement negotiations. Whilst HSBC is adamant on holding back on local negotiations, MUBE is constantly receiving feedback that management is effectively spending much more on international recruits who are being paid ‘hefty' financial packages and who seem to be leaving a negative impact on the balance sheet to the detriment of local employees. Following an intervention from the Office of the Prime Minister MUBE agreed to return to the negotiating table however it soon became clear that the ‘concrete' proposals put forward by HSBC not only fell very short of solving the current impasse but were aimed at re-opening negotiations and re-proposing those very issues that MUBE had objected to since the start of negotiations in October 2013. Needless to say, the Bank's proposal all the more complicates the current impasse and in MUBE's opinion clearly shows why after all HSBC decided to unilaterally withdraw from a done deal way back in August 2014. The Malta Union of Bank Employees - MUBE has written to management proposing mediation as a way forward in order not to prolong any further and is still awaiting a reply.